Happy Friday everyone! Can you believe the weather out there? Every time I walk outside, I can’t help but smile. Light sweaters and capri weather is on it’s way! Welcome to my first installment of Snack Time! In these posts, I’ll be sharing some of my favorite recipes with you. While I promised to post the Mexican Lasagna Recipe, I’m still working on how to word it. Maybe I’ll get it down on paper (intelligibly) very soon! For now, it’s time for a yummy snack I like to call, Wonka Corn. I have to admit, I’m very partial to the plain ol’ salt & butter deal, but sometimes it gets a little boring. About a year or so ago, my family did a mini cook-off competition with a popcorn theme, and I decided to go desserty. I’m glad I did. This was super tasty! 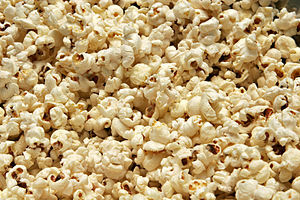 First off, if you’re not sure how to make pop corn, Aarti explains it beautifully here. BUT instead of adding Indian spices, add the following ingredients. 2 tablespoons of ginger pulp – I got mine from a glass jar, but if you’re up to it and want a more pungent flavor, blend it up yourself! 1/4 cup of orange juice – or if you want to use orange extract, use it sparingly. A little extract goes a long way! Once you’re ready, pour your creation on top of your popcorn and let it sit for about five minutes. Grate a small amount of zest (prefferably orange) on top, and then you’re ready to eat! It’s delish!